Italian mouldmaker, Fomar Stamp, has switched to Delcam’s PowerMILL CAM system for all its machine-tool programming to help the company to achieve the high precision and high quality demanded by its customers. Founded almost forty years ago, Fomar Stamp designs and produces high-precision multi-cavity moulds for the plastic industry. Founders Clemente Fontana and Egidio Martinolini began the business in a renovated shed. From the start, the company made moulds for all types of customers. 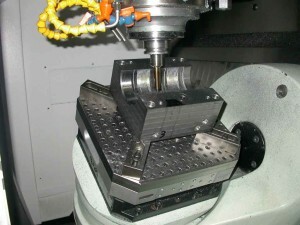 Most of the tooling now produced is for engineering, cosmetics and medical applications. The company grew steadily through the 1970s and 1980s. This expansion prompted a move to much larger premises in Mesenzana in the province of Varese, where Fomar Stamp could focus on larger and more complex moulds. Mesenzana is not far from the Swiss border, which led to increasing business in that country. Now, 90% of the company’s production is for foreign customers, especially for clients in Switzerland. As part of its expansion strategy, Fomar Stamp started to investigate five-axis milling, believing that the technology could improve its productivity and allow it to produce tooling that was difficult or expensive to make with only three-axis equipment. However, the new equipment meant that the existing CAM system would need to be replaced. Fomar Stamp reviewed systems from four CAM companies before selecting the two that appeared to be the most suitable for a final machining benchmark. The results convinced the company to choose PowerMILL as its five-axis software. The decision was based not only on the quality and precision of its five-axis strategies, but also because the Delcam software appeared to offer more powerful and flexible three-axis options than the other CAM solutions. As a result, Fomar Stamp purchased two PowerMILL five-axis licences, with advanced simulation and verification, to provide programs for its three-axis and five-axis Mikron milling centres, plus two licences of the PowerMILL Surfacer data editing and repair module. The company also added the FeatureWIRE software for its wire EDM equipment.